You are here: Home > Search for "Static Solutions"
lifetime. It's NIST certified, lightweight, versatile, and robust. These CC-2641 premium coil cords are designed to fit the pin jack inputs of the RT-1000 and the associated electrodes and probes that are equipped with a banana jack input. They are robust, RoHS compliant and will stretch to a comfortable 5 feet. The high dielectric provided by the insulation insures accurate readings when used to test resistance and conductivity. Static Solutions CC-2641 STRAIGHT Replacement Cables for use with the RT-10000. These 4’ 4”' long cables are equipped with a 3.5 mm male phono style pin jack on one end and a 1/8" male spring loaded banana jack on the opposite end. The 3.5 mm pin jack securely fits into the inputs of the RT-1000 while the standard male banana jacks with multiple spring loaded flutes fit a multitude of electrodes including the MP-6533 (personal hand held electrode), the RP-4323 (5 pound electrodes for testing ESD floors, mats etc.) and the GC-5621 garment clips. These cables feature heavy duty strain reliefs and a high dielectric insulation for dependable accuracy when testing in the static dissipative range of electrical conductivity. 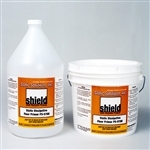 Formulated to seal concrete floors before the use of GP-5600 ESD Floor Paint. the amount of paint needed. GP-5600 dissipative floor paint is a one part latex coating ideally formulated for the electronic manufacturing environment. With consistent readings in the 106 -108 Ohms regardless of relative humidity, this paint provides an effective fast and safe path to ground. This optional miniature probe is used with the Ohm-Stat RT-1000 Standard Resistivity Tester. It accurately measures surface resistivity and conforms to the EOS/ESD 11.11 specifications. The RT-500 Megger measures electrical resistance using an LED display. Parallel bars on the back of the unit are perfect for spot checking matting as well as flooring. Optional electrodes are available for testing ESD shoes, heel grounders and more. The Static Solutions CT-8720, CT-8725 & CT-8700 provide fast complete testing of ESD wrist straps and / or ESD heel straps. United provides THE Guaranteed lowest published price in the Nation on these quality units. Should you find these units at a lower published price simply let us know. We'll beat it by 3% and send you a free static control gift for your time!